The best text to speech for Linux software that provide high quality text to speech -- The sound have the highest quality among TTS (Text to Speech) systems, you can try unit selection voices, not hsmm, they should be less robotic -- TTS with natural sounding speech. What is the best text to speech program in Linux? If you try to find a good solution to TTS on Linux to help you proofread nearly everything you write as without it you almost always have to many mistakes. There is not only good tts for Linux called Cepstral. The Cepstral, paid Linux software for TTS can speak any text they are given with whatever voice you choose. Cepstral is building new synthetic voices for Text-to-Speech (TTS) every day, and can find or build the right one for any application. This feature available if you are using Google Chrome as your browser because the text to speech software in Linux provided by an Chrome extension! Here is what I did to have pure natural speech for PDF and TEXT FILE for FREE (other solutions are not natural or they're just paid services). Install SpeakIt! extension on your chrome or chromium. Drag and drop your pdf or text file (*.txt) to browser. Now highlight some text and right click and select SpeakIt! from the rught click context menu. 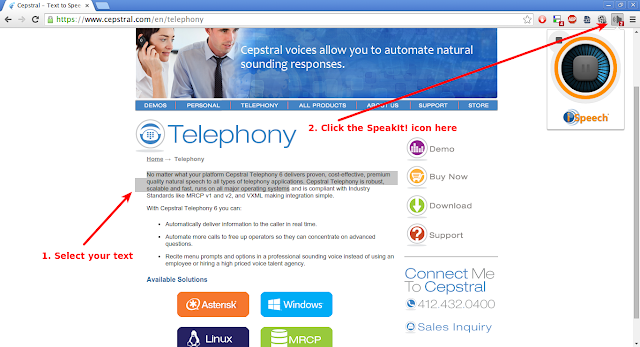 Or you can click icon near the address bar so you can listen to pure natural text-to-speech (check the picture above). There's also ways to open other files like .doc and .txt in chrome and do the same. There's other extensions for chrome that view pdf files, check if it fits you better. Besides you can upload all kind of texts in Google Drive and use SpeakIt! to read it for you. You need to convert your document into pure text file with .txt suffix and drag and drop it into Google Chrome if you want to read it using this extension, also yo need an internet connection.